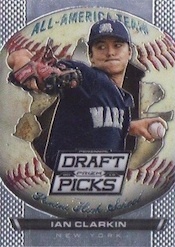 2013 Panini Prizm Perennial Draft Picks Baseball dives right in to the 2013 MLB Draft. 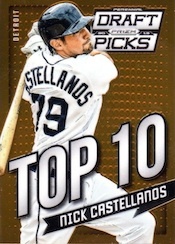 The set delivers plenty of trademark Prizm parallels, the latest draft picks and on-card autographs. 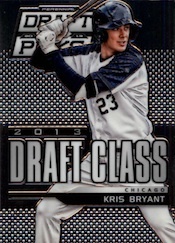 The 2013 Panini Prizm Perennial Draft Picks Baseball base set has 100 cards. As with other Prizm sets, parallels play a major role. The Prizm rainbow includes Red, Blue, Gold and Black cards. Hobby boxes deliver a total of six parallels. Prospect Signatures is a massive set of 100 autographs. 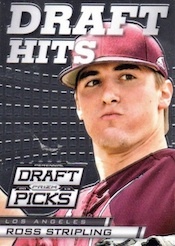 Signed on-card, the checklist includes the top two picks in the 2013 draft, Mark Appel and Kris Bryant. 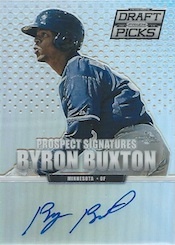 Other signers include Byron Buxton, Mike Foltynewicz and Maikel Franco. 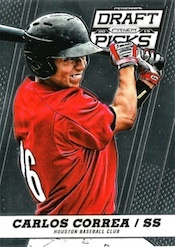 The product also includes the first live pack-inserted autographs of Jose Abreu. 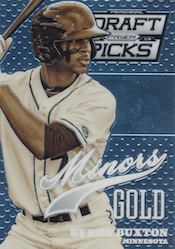 Like the base set, Prospect Signatures have Red, Blue, Gold and Black Prizm parallels. 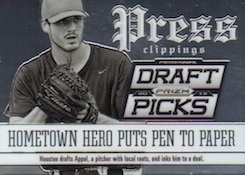 2013 Panini Prizm Perennial Draft Picks Baseball has four autographs in every hobby box. Basic inserts land three per box. First Overall Picks highlights some of the most famous players who have gone number one in the draft. 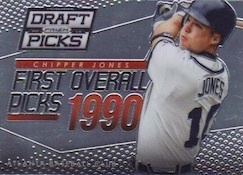 The ten-card checklist includes Ken Griffey Jr, Chipper Jones and Harold Baines. 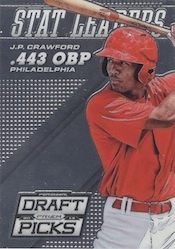 The 50-card 2013 Draft Class goes through top prospects who were selected in June. Great looking cards with a mirror finish. The on card autos are a BOUNS. 4autos a box with some nice color. I think ppl are missing out on this product. Go get a box, prices have dropped. Get he box from us at THE CARDMAN SPORTCARDS, We are a brick and mortar shop in New Jersey.